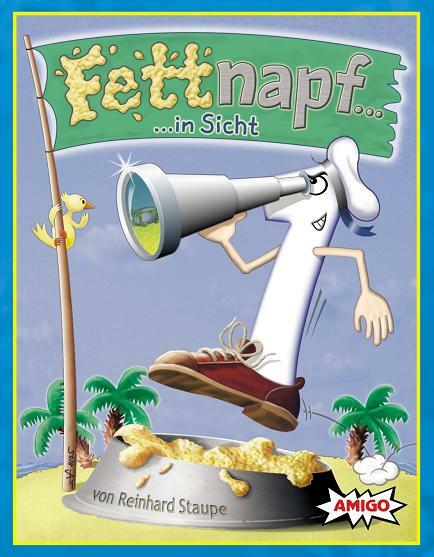 In Fettnapf by Reinhard Staupe, the object of the game is to get rid of your cards. Sounds simple, but as the game title suggests, little problems arise everywhere. In turn order, cards are played out and the values added together or subtraced: 24â€¦29â€¦32â€¦25â€¦ but beware: if you say a number that someone has in hand, then youâ€™ve put your foot in it. Those with a talent for this will learn how to ship a Fettnapf around and win the game. Each player receives 3 cards (valued 0 to 9) and an island card (21 to 30). In turn order, each player plays a card and draws a new one into his hand. The played-out cards get added (up to 30) or subtracted (down to 10) and announced out loud: 24-28-32-26-18-9-12. Whenever a player goes over the limit, the right-hand player gets an island card. When a player announces a number that another player has in hand as an island card, then heâ€™s put his foot in it and receives a Fettnapf card. The game ends when a player has collected 3 Fettnapf cards. The winner is the player with the fewest Fettnapf cards.